SKU: 9999. Categories: Shop All ThinLine Products, Horse And Rider Tack, Equine Bell Boots, Horse Boots. Tags: horse bell boot, over reach boot, pull on bell boot, turn out bell boot. Just as the name implies, this is a bell boot designed to give horse owners unheard-of longevity. Redesigned from the ground up, this one-piece polymer bell boot offers unmatched durability and protection for your horse. GatorBootz has a patented latch designed to be opened by humans but never by equines. Velcro closures are generally the failing point of horse bell boots. By eliminating Velcro we have greatly extended the lifespan and greatly reduced the hassles of bell boots. Additionally, Gatorbootz makes contact on the hoof, not the soft tissue. Bell boot sizing is determined by hoof size. If you know the size shoe your horse wears you know what size Gatorbootz to order. Issues of variable fetlock sizing are solved with this design. Are you tired of replacing bell boots? The average pair of Gatorbootz lasts 10 months. One-third of horses achieve 36 months of turn out protection. Additionally, GatorBootz comes with a one-year full product replacement guarantee. The GatorBootz’s unique latching system makes it easy to release the boot with just two fingers. Simply hold the top of the boot in your left hand, buckle facing you, pull down and out with your right hand, the zip tongue needs to disengage at a 45-degree angle. The left and right boots are symmetrical, which means you don’t have to worry about left and right boots. To ensure your latch remains closed, slide the latch to the last setting. New designs mean learning a new skill. This boot’s latching system is unique. Hold the top of the boot (black portion) in your left hand, buckle facing you, pull down and out with your right hand (also on the black portion), the zip tongue needs to pull down at a 45-degree angle. Once you do this it will become easy and second nature. We are able to release the boot on the horse with just two fingers. Tips and tricks: if you find the boot a challenge to open the first time, spray a little wd-40 inside the latch. You will not need to repeat this after the first operation. Also, hose off your boot if the latch becomes encumbered with mud. It should release easily for you. If your bell boot latch ever appears to be stuck, we have an emergency release system: simply place a hoof pick under the buckle, raise it up a bit and then the strap will slide out. This is not intended for frequent use, only if you need to quickly release the latch. Safety: The latch is designed to break at the rivets behind the buckle should your horse manage to get the boot hung on something. These boots are designed for longevity. The bell portion is made of the highest strength polymers (not found in any other bell boot). Designed primarily as a turn out boot. Patented neck and latch design allow this boot to fit without rubs. 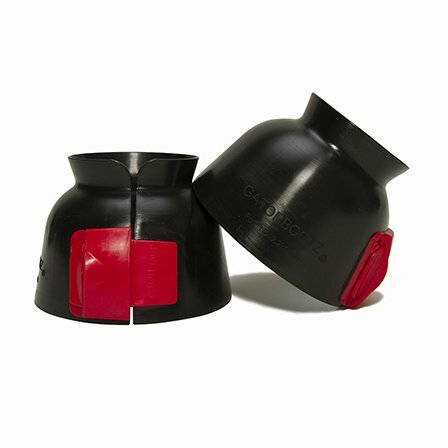 GatorBootz is the most durable bell boot on the market. During normal turnout and riding the latch should stay securely closed. If you find the latch opens occasionally, your boot may be too small, simply contact us for a larger size. The latch may release in very aggressive riding situations such as cross-country competitions or trail riding through mud. Securing the boot with a product like duct tape will ensure your boots will remain on in the toughest conditions. Simply tape all the way around the boot, covering the latch. Boots generally do not release in daily situations like turn out. As you can see in this image. The GatorBootz “holds” to the hoof, not soft tissue. Meaning your fit is determined by shoe size. GatorBootz are currently available in Size One and Size Two shoe sizes. We hope you love the newest design in ThinLine Tack Technology. The medium #1 size is 4 inches high 3 ½ diameter at the ankle and 5 ½ diameters at the bottom of the bell. The large #2 size is 4 1/12 inches high 3 ¾ diameter at the ankle is and 6-inch diameter at the bottom of the bell. Gatorbootz come in two sizes: Medium is a Size 1 (fits Size 1 shoe), and Large is a Size 2 (fits Size 2 shoe). The variable latch and unique design accommodate nearly every ankle size, so you can fit this boot on just about any horse. We recommend a daily hosing, especially if you are using them for turnout. They wash well in the machine in cold water too. Enjoy your long lasting, hassle free boots! Gatorbootz’s are a 100% Polymer design. The bell portion is constructed of a moderately flexible plastic. The stiffer the plastic, the longer they will last. The patented latch is plastic and attaches with plastic rivets within the bell portion. This allows the boot to not fail but provides an eventual break system should the horse hang the boot on something. I am on day 111. Who knew anyone could make a bell boot to not only last that long but look just like they did the day I put them on. Amazing! Thank you ThinLine! I spent a little bit of time on the website reading about them and I’m 100% sold! My guys always lose them in the field and sometimes even cross country. These bell boots sound like the perfect fix to these problems. I went ahead and ordered a pair and I’m super, super excited to get them!! I got my ThinLine Gatorbootz in the mail a few weeks ago and I LOVE them. They actually have stayed on my horse for more than a few hours, which has been the record with all other bell boots that I have tried. They have completely survived the past few weeks being on him, no rubs, no rips, and he hasn’t lost them a single time being turned out in them! I can’t wait to take them out for a spin on the cross country course and see if they stay put through the water. My Quarter Horse is quite talented when it comes to losing a bell boot during turnout. I was at a loss keeping matching pairs and trying to maintain the budget. I came across these boots quite by accident and thought, “why not”? It’s been a little over a month and he still has the matching pair!! I also use them for schooling, and showing. Once I learned how to get them open, I kept wondering, “where have these boots been all my life”? I LOVE THEM! They are sturdy, no rubs, quick & easy to get on and off, and easy care. This is now my boot of choice, so it’s time to get a second pair! The versatility of this boot to go from field, to schooling, to showing, is unmatched. They have paid for themselves two fold!! Stiff and durable. These will not flip up and won’t be pulled off – even by the other front foot. They are not easy to get off so practice opening and closing them off the horse first! Every once in a while a product comes along and it’s like “hmmm how did these not exist earlier and how did I survive without them?” GatorBootz are one of those products. I am very familiar with ThinLine, as I have been using ThinLine saddle pads for years. Recently GatorBootz have completely taken over my barn. I used to have to buy at least 4-6 pairs of bell boots every year, but the GatorBootz are amazing at holding up! Game changer really. Traditional bell boots sometimes rub the hair off my horse’s coronet bands/pasterns and this is not a problem at all with GatorBootz. We ordered these boots going on 2 months ago, and I’ve waited to (literally) “field test” them before I wrote a review… AWESOME. They have completely solved bell boot issues with the Houdini of the barn. He’s turned out 24/7 and has comfortably been living in these boots. No rubs or irritation, and equally as important- he really can’t get them off! If you’re wondering, in our experience, they do float around his pastern- the red clasp will sometimes end up behind his heel- but it’s not a problem at all, and just as easily turns back to the front as its worn. I probably wouldn’t use them for everyday schooling with impatient horses, as it seems to take ME a minute to get them on/off, but they really change the game for turnout, and I imagine they would be wonderful for cross country. These are fantastic. I can’t get over how great they work. I use them for turnout and I never expected them to last this long. I have a quarter horse named Patrick who needed bell boots on his hind feet as well as his front. The problem we had was that he was continually removing the back left boot no matter what brand or style we used. There are still about 5 bell boots out in his pasture somewhere. Gatorbootz has solved the problem! Patrick has kept them on 51 days so far. This is so much better than scouring the field trying but oftentimes not succeeding to find the missing boots. The price of the Gatorbootz has been offset by not having to buy so many replacement boots. Unfortunately, these did not hold up to our master mind bell boot remover. No the tabs did not break. Our guy figured out(took him a couple of weeks) how to get them off. Our barn manager had difficulty getting them off, but the horse is too clever for his own good. I purchased these in September 2016. They are still on my horse and functional which is quite a feat because I have a chronic overreacher that regularly destroyed bell boots. They stay on 24/7 in full time turnout and I haven’t had a single issue. I don’t dread going to check on my horse and finding him missing a bell boot or a shoe! He used to pull shoes every two weeks at minimum and he hasn’t pulled a shoe in 3 cycles. The clasps are beginning to get banged up (scratched and scuffed from being knocked by his hind feet) but work just fine. They do rotate some but the clasp ends up either at his heel bulb or on the lateral hoof wall. He doesn’t have any irritations or rubs with them either – I’m a convert! Worth the $$! I LOVE these boots!!! I bought a pair in July last year and my horse has worn them every single day. I am replacing mine after 9 months of continuous use. I had been buying a new pair every month or so and would lose shoes with regular bell boots when my horse would over reach . Thinline’s Gatorbootz fixed the problem! These boots are worth it! I have saved a ton of money not having the ferrier out to fix a thrown shoe or not having to constantly replace other boot brands. I really love these boots, my horse has to wear bell boot 24/7 and he shreds the velcro closures on other boots. My only option was the old fashion pull on rubber ones, which are almost impossible to get off and on for me. The Gatorbootz are simple to put on and off, and while Jango finally learned how to remove them he only gets them off about once a week. I think when the boots come in a smaller size that issue will be solved. They are tough and easy to use and I will recommend them to my friends. My horse is known for pulling off bell boots-the Velcro closure ones he would pull off with his teeth and make into play toys and the pull on ones he takes chunks out of when he gallops around. I ordered these and am pleasantly surprised. I used to go through 1-2 bell boot pairs a month (so long as he didn’t rip them with his teeth) and I’ve had these for 5 months and they’re still going decently strong. He is base narrow and over tracks a bunch so when he’s galloping around, he will occasionally pull them off (1 or 2 times every 2 months), HOWEVER unlike every other single pair of boots I’ve tried before, I can put them back on and they’re still in great shape. There are a couple small tears around the edges of the red fastening due to him pulling them off, but otherwise they look great. It’s still a bit of a pain that he can pull them off, but for me, it’s worth it since I can actually re-use them each time. The “no turn” knob on the back doesn’t really work for my horse, but these boots have never rubbed him and he’s got pretty sensitive skin. Overall, I’ll probably purchase a back up pair so that I don’t have to go and search for the lost bell boots right away. I love these boots. My mare can’t seem to keep standard bell boots on for more than a few weeks, either tearing, breaking or pulling off, she’s constantly mismatched and we are always replacing her bell boots. We are on our 2nd pair of Gatorbootz, replacing the first ones with an updated tab that was a little easier to remove. These boots do require a little bit of a learning curve to learn how to get one and off, and when caked with mud can require a little extra work, but they are absolutely worth it. She’s been in these boots for about a year and has just now “lost” the first one. They have held up great with minor cosmetic wear on the boot, and just starting to wear on the tabs. In the event they do get a little stuck, sticking a flat head screwdriver in the tab releases them quickly and easily. The only time she doesn’t have them on is when she’s at a show and in and out of bell boots several times a day with multiple people handling her. We use the Velcro tab closures for convenience, but as soon as she’s home, she’s back in these. Hasn’t lost a shoe or clipped herself since we’ve had these. We are super happy and highly recommend you give them a shot. Worth every penny. Q What exactly does the replacement warranty cover? Does it cover loss, my horse loses the pull on bell boots constantly and i sometimes cant find them in his large field. Q Will the size 1 fit a 00 shoe size? A These boots are designed to correspond to horseshoe sizes. While the size 1 boot might be too large, we have a 30 day return policy, so feel free to give them a try! Q When are you going to make a larger size? My horse wears size 3 easy boots and L or XL bell boots. A Thanks for your question! At the moment, there are no plans to make these in a larger size, but will pass your request along. We offer a 30 day satisfaction/no hassle return guarantee, so you may want to order the large and give it a try! Q my horse has chewed his to the point of barely still usable, wondering how the warranty/guarentee works? Going to purchase a second pair but would olove to have the first pair replaced? A Thank you for your question! All ThinLine products are covered by a 30 day Satisfaction Guarantee and a 1 year limited warranty. Please email us at info@thinlineglobal.com and include your date of purchase and product details. Q Is it possible to buy 1 boot? A Thanks for your question! The Gatorbootz Bell Boots are only sold in pairs. Q Will size L fit big Warmbloods (17 hands and over)? A The GatorBootz fit on the hoof of the horse so sizing is done by shoe size. Horses can be tall and yet have small feet so just find out what shoe size your farrier uses. A size two shoe fits the large boot, a size one shoe fits the medium boot.